How Does a Hackintosh Netbook Compare to a G4 iBook? AT&T Talking with Apple about 3G MacBooks? 15" MacBook Air Coming Soon? "As I am a technology journalist I perhaps should not admit this, but until recently, I had been using the same beaten-up old laptop since my university years. It was perfectly capable of running the few simple applications I needed it to. "...I looked something of an oddball as I sat in conference rooms full of reporters and delegates tapping away on the latest flashy devices. "Among that throng of laptop-wielding business users and journalists I had spotted a discernable shift in hardware use - more of them were turning up to industry events with MacBooks. "To me, Apple's sleek line of gadgets exudes a sense of the trendy and cool, but are they serious business machines?" "I have always had a few doubts about buying a Mac. They seemed overpriced . . . thanks to a recent visit to a duty free shop when suddenly price became less of an issue...."
"Apple said Wednesday that it's facing unexpected delays related to its new unibody 17-inch MacBook Pros and won't be capable of shipping orders for at least another two weeks. "'Wrapping up the new 17-inch MacBook Pro is taking a few days longer than we projected,' the company said in an email sent to thousands of customers this afternoon. 'As a result, we will be unable to ship your 17-inch MacBook Pro until February 19, 2009.'" "The MSI Wind continues to top out the charts as the most Macintoshable netbook around, but what's real life performance like, non-anecdotally? "The guys at Apple Different did some good old fashion benchmarks, and discovered that an Atom N270 at 1.66 GHz and 1 GB of RAM churned and cogitated Leopard better than a late 2004 iBook with a Power PC 1.33 GHz processor and 768 MB of RAM, with a boot up time of around 48 seconds to the iBook's agonizing minute...."
A 1.33 GHz G4 holds its own against a 1.6 GHz Atom in most tests. 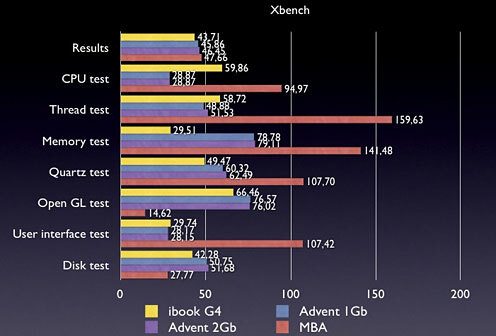 Link: How Does a Hackintosh Netbook Compare to the iBook? "If you have a desktop or notebook computer and are aged between 25 and 55, there's nearly a one in five chance you have already bought a netbook. "According to a PriceGrabber survey, netbook users overwhelmingly own desktop PCs (91 per cent) and a notebook (87 per cent) and PriceGrabber's report writers think this is because the three systems complement each other and are used for different things. They don't mention the possibility of gadget-hungry geeks buying the latest stuff for the sake of it. "The report doesn't look into the correlation between smartphone and netbook ownership. It's probably high, leading to a 4-way data synchronisation problem...."
"Acer will extend its lead over Asus this year, as World+Dog buys even more netbooks, causing demand to surge. "DisplayBank's forecast for the mobile PC market as a whole anticipates 14.9 per cent unit growth, with 2008's 133.22m shipments rising to 153.12m this year. It forecasts that some 17.2 per cent of those machines will be netbooks - some 26.34m, in other words. "That's a 79.8 per cent year-on-year growth rate, we calculate... and a sign that demand is shifting toward netbooks. "But it won't last - they'll not account for more than 20 per cent of the mobile PC market, DisplayBank reckons, at least not through 2012...."
"If you have been reading Mobile Magazine for the last six months or so, you've probably noticed my inclination for a MacBook Nano of some kind to be released by Apple. "To me, an Apple-branded netbook or UMPC would sell very well in this market and it could be a huge boon for Steve Jobs and the rest of the Cupertino crew. A fake MacBook Nano just doesn't cut the mustard." "Apple's Mac division was able to withstand recessionary pressures last quarter by neutralizing a decline in desktop sales with a sharp rise in notebook sales. Will it continue? "A new survey released by ChangeWave Wednesday makes it clear that despite a relatively strong first quarter, Apple is not out of the woods yet. Of respondents planning to buy a notebook in the next 90 days, the percentage of those planning to buy an Apple notebook fell six percentage points to 28 percent, as compared with November's survey." Macintosh Unit Sales, holiday quarter 2004 through holiday quarter 2008. "Demand for Apple's laptops appeared to fade following the holiday shopping season, according to a survey of 3,476 consumers by research firm ChangeWave. "In a blog post, ChangeWave writes that a survey taken January 5-12 found sagging overall PC demand - and asserts that Apple 'will be especially hard hit this quarter by the continued economic downturn.'" "AT&T is hoping to make 3G-enabled notebooks a staple of its cellular business, and in an executive interview hints that it may be chatting with Apple to extend its reach into MacBooks or other non-iPhone devices...."
Link: AT&T Talking with Apple about 3G-ready MacBooks? "This rumor has to be consumed with a massive bucket of salt, but the potential prospects could have plenty of Apple fanboys swooning in anticipation. "A random blog based out of China with 'a debatable track record' is saying that Apple is currently working on a 15-inch version of the MacBook Air, bringing the super slim design up to another notch on the scale. This almost goes against the whole point of the MacBook Air in the first place, since it was supposed to be thin, light, and small...."
Link: 15-Inch MacBook Air Soon to Come? "Business communications have never been better, so we are told. The combination of pervasive, high speed connectivity and a variety of portable devices untethers the workforce and enables real time communication, higher levels of responsiveness and better collaboration. In theory. "Just because a user can work anywhere, any time doesn't mean they should, and this needs to be taken into account. To kick off the discussion, the following table looks at the pros and cons of communications mechanisms available to the laptop-enabled mobile workforce." "With the introduction of the 17-inch unibody MacBook Pro at January's Macworld Expo, Apple has moved almost its entire portable product line over to glossy screens. I say 'almost' because the 17-inch model is available with an optional ($50) 'anti-glare' option - not an actual matte screen, it would seem, but some sort of a screen treatment to cut down on the glare. "But then I visited the TechRestore booth at Macworld Expo to check out its matte-screen replacement program for the 15-inch MacBook Pro. (TechRestore currently modifies only the new 15-inch model, but the company has confirmed that it will soon have a replacement program available for the MacBook, too. So if you're a fan of Apple's smallest full-featured - OK, except for FireWire - laptop, but not of glossy screens, you'll soon have a solution available.)" "Arrrgh. How many times have I murmured that in relation to battery power woes on older PowerBooks and Newtons . . . Over the past few months, I have had a bad string of luck with batteries, which is why I decided to write about the issues that I had, and how I overcame them. I have broken it down into two sections, the first section will cover problems and solutions for PowerBook batteries, and the second section will cover the Newton." "In January, for the tenth year in a row, I took my little Hewlett-Packard Jornada notebook to a trade show in Las Vegas. The tech industry gathers there annually for a confab, which these days happens to be at the Consumer Electronics Show (otherwise known as. As an industry analyst, I go to visit with clients and prospects as well as to see the latest technologies. And I like to take notes. The Jornada was a demo unit from a HP press event in Grenoble, France, in 1998. "As I fired up and snapped shut this highly reliable machine during a cascade of meetings, I was again struck by its practicality. Although dated by any definition, the old Jornada remains - year after year - exactly the right tool for the job at hand: taking notes in appointments scheduled one after another all day in venues scattered throughout the city...."
PR: iToppers.com has introduced two new MacBook skins celebrating the new President, Barack Obama. 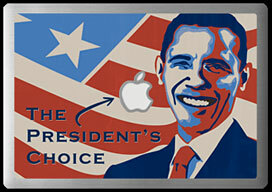 Whether you voted for Obama or not, Mac lovers everywhere were excited to learn the new President is a fan of Mac computers. MacBook owners can show off their American pride and join our President in letting everyone know that the Mac is definitely the President's choice when it comes to personal computers... Now there's some CHANGE all Mac lovers can definitely get excited about. iToppers have added a lot of new designs at iToppers.com on their newly updated website, including the best-selling Tie Dye skins. 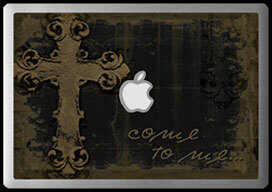 iToppers.com was the first on the market with skins designed specifically to show off that glowing Apple logo, and today they continue to offer great new skins to personalize MacBook computers... including skins for the New 2nd Generation MacBook starting at $12.95. iToppers have designed their MacBook skins to enhance the style of the best looking portable computers in the marketplace. Rather than offering a generic skin designed to fit any computer, iTopper skins have been designed to specifically fit your Apple MacBook or iBook perfectly. 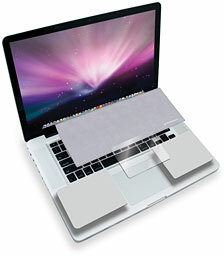 Easy to install, iToppers' MacBook skins and iBook skins protect your Apple laptop from scratches. I particularly like the iToppers faith-based skins, like "Come To Me". The iToppers Portfolio skin was designed to be reminiscent of the original "clamshell" iBook computer. The clean and tasteful design enhances your 'Book and and looks like it came from the factory that way. Priced at $12.95, this skin is an economical way to add a colorful identity to your MacBook while protecting it from scratches. Here it is in my personal fave clamshell iBook color - Key Lime. Unlike a lot of other generic skins out there, iToppers designs their products so they work with the overall design of Apple portable computers, being careful to ensure that dimensions and spacing enhance the computer without compromising its' integrity. In fact, Apple recently recommended the iToppers product to a music company interested in purchasing customized MacBooks for a consumer promotion. All iToppers skins are made in the USA using top-quality pressure sensitive vinyl and are fairly durable. iToppers are fairly easy to apply if you follow the basic instructions provided. There are two methods that can be used to successfully apply iTopper skins with relatively similar success. Both are described in detail in the application instructions that come with your iTopper. Removal of the iTopper skins is relatively simple with a little effort. Instructions for removal are also provided with your application instructions. 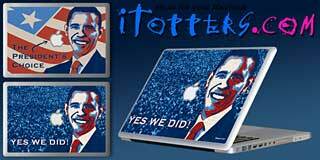 iToppers ship to anywhere in the Continental United States, Canada, and outside the United states via USPS. Exact shipping & handling fees will be calculated using the USPS standard rates at time of order. Most orders are shipped within three business days of receipt of payment. If an item is out-of-stock, you will be notified by email with an estimate of when your item will be shipped. Priority shipping is available for some locations. No orders will be shipped until payment in full is received. 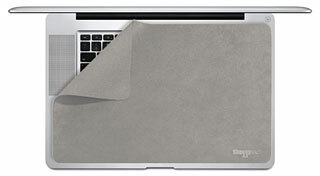 PR: Protect your MacBook Pro from nasty scuffs, marks, & imprints. The ShaggyMac lays on the keyboard surface and cushions / protects the screen while the lid is closed. This screen protector was designed specifically for the MacBook Pro. The slimmer material is compatible with the magnetic latch, and low-profile. The ShaggyMac Screen Protector is made from an advanced optical polishing cloth, which will keep the MacBook Pro's glass LCD screen & glass trackpad looking great. Sensible insurance for your MacBook Pro. When file transfer speeds in the field can make or break a project, call in the pro - Tempo SATA Pro ExpressCard/34. This Sonnet exclusive two-port eSATA adapter delivers the highest available throughput performance from a SATA host controller for notebook computers - 40% faster than standard SATA controller cards - and is ideal tool for video capture and editing in the field, studio, or office. Tempo SATA Pro ExpressCard/34's exceptional sustained data throughput capability of up to 200 MB/sec empowers it to support more simultaneous video streams during playback, and enables faster file transfers for content of any kind. Tempo SATA Pro ExpressCard/34 is FIS-based port multiplier-aware - used in high-performance storage systems like Sonnet's Fusion D500P, a port multiplier manages the data flow of up to five drives in an enclosure through a single cable - enabling you to connect up to ten SATA hard drives(1)(2) to your computer. Based on Sonnet's acclaimed Tempo SATA E4P SATA host controller for desktop computers, Tempo SATA Pro ExpressCard/34 delivers significant gains in read and write data transfer speeds over earlier-generation eSATA ExpressCard adapters, with remarkably higher throughput than FireWire® and USB adapters, when used in combination with storage systems featuring two or more drives. Tempo SATA Pro ExpressCard/34 controller plugs directly into a MacBook Pro (15" or 17") or Windows notebook with an ExpressCard/54 or ExpressCard/34 slot, and is an essential tool for the professional creative person on the go. 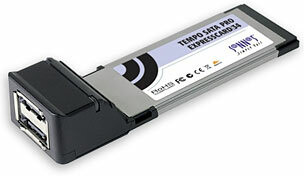 Tempo SATA Pro ExpressCard/34 gives you access to as many as 10 drives wherever you work. (1) Support for 10 drives requires the use of drive enclosures employing port multipliers (like Sonnet's Fusion D500P, Fusion D400Q, or Fusion R400Q). When using an enclosure without a port multiplier, Tempo SATA Pro ExpressCard/34 will support 2 drives. (2) Western Digital manufactures Desktop edition (WD Caviar, Caviar SE, Caviar SE16, and Raptor X) hard drives and Enterprise (RAID) Edition (WD RE, RE2, and Raptor) hard drives. Each type of hard drive is designed to work specifically in either a desktop computer environment, or connected to a RAID controller (hardware or software-based). If you intend to configure Western Digital drives in a RAID set, Sonnet and WD recommend using only their Enterprise edition hard drives. For more information, see this Western Digital FAQ. Sonnet's Fusion D400Q and R400Q quad-interface storage systems are not affected by these issues, and are fully supported. PR: nova media has unveiled iCON 431, a sleek 3G USB modem with memory stick functionality for Macintosh computers. The iCON 431 supports most kinds of mobile connection speeds and can be used worldwide. The iCON 431 supports high speed data transfers with up to 7.2 Mbit/s download and up to 2.0 Mbit/s upload, depending on the network's capabilities. The modem includes a microSD card slot, so it can be used as a memory stick with up to 8 Gigabytes of memory. For future compatibility, it is upgradeable to support high upload speeds with up to 5.76 Mbps. "The sleek design and silver/black color scheme makes the iCON 431 a perfect match for any recent Mac." states jan Fuellemann, PR spokesperson at nova media. "The USB connector is retractable, which makes this modem extremely easy to transport." The iCON 431 includes the internet connect wizard launch2net for Mac OS X which offers a one-click connection to the Internet without the need to enter cryptic configuration details. launch2net already includes connection settings for most mobile network providers worldwide and displays time and data consumption of mobile online sessions. The iCON 431 is available today from nova media for Euro 168 (plus sales tax if applicable), and requires Mac OS X 10.4.11, 10.5.2 or higher and a SIM card enabled for mobile data connections. The modem includes a connection software for Windows and drivers for Linux can be obtained from nova media. PR: Marware Inc, designer and manufacturer of innovative products for the Apple market, announces the Keyboard Protector Silicone for the new aluminum unibody MacBook, MacBook Pro and MacBook Air. This smooth silicone keyboard skin protects against dirt, oil, crumbs, and accidental spills. The individual keys are molded for a perfect snug fit, while remaining ultra thin, only 0.44mm. The Keyboard Protector Silicone is removable and hand-washable for your convenience. 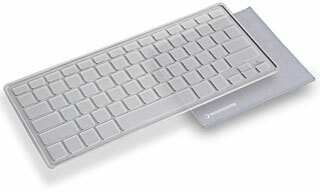 The Keyboard Protector Silicone fits all aluminum unibody style Notebooks, with US style keyboard. The Silicone Keyboard Protector can be used in conjunction with Marware's Protection Pack Silicone (sold separately) for the ultimate combined interior protection and comfort. The Keyboard Protector Silicone is available in clear, black and white and comes with Marware's Lifetime Warranty. The Keyboard Protection Silicone is available in clear, black, and white. It retails for $24.99 (USD) and is available now for order online. Please visit Marware for more information. Marware is a leading provider of software and accessory solutions for Apple iPhones, iPods, and Notebooks. PR: Marware Inc, designer and manufacturer of innovative products for the Apple market, announces the Protection Pack Silicone for the new aluminum unibody MacBook, MacBook Pro and MacBook Air. 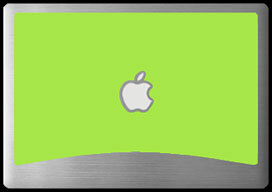 The Protection Pack Silicone is aluminum colored to match and complement the new aluminum unibody Apple Notebooks. The trackpad cover protects without interfering, and is made of a thin, clear film designed to minimize oily fingerprints, dirt, and scratches on your trackpad. The two-in-one soft microfiber keyboard cloth prevents the transfer of dirt and oil from the keys to the display, and doubles as a safe cleaning cloth for the screen and exterior of your Notebook. The Protection Pack Silicone also works with Marware's Keyboard Protector Silicone (sold separately). The Protection Pack Silicone comes with Marware's Lifetime Warranty. 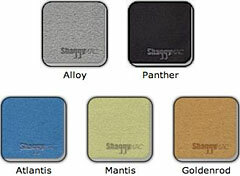 The Protection Pack Silicone is available in aluminum color, for the MacBook Air, MacBook, and MacBook Pro. It retails for $24.99 (USD) and is available now for order online. Please visit their website for more information. Marware is a leading provider of software and accessory solutions for Apple iPhones, iPods, and Notebooks. PR: V7, the exclusive house brand for Ingram Micro Inc. and provider of premier computer accessories worldwide, today announced a new line of V7 carrying cases manufactured by Targus, makers of the world's best-selling laptop cases and accessories. "V7 by Targus" laptop bags will be sold through Ingram Micro's global network of value-added resellers (VARs), small-to-medium business (SMB) customers and systems integrators. The V7 by Targus brand includes a full line of laptop computer carrying cases, including a deluxe top-loading case, two backpacks, a messenger bag and a slip case. Showcasing both style and function, the laptop bags use high-quality materials to achieve a design with the economical, fashion-conscious, business-casual user in mind. "V7 by Targus cases are an excellent choice for VARs and small-to-medium business (SMB) customers who are looking for the quality, reliability and performance found in laptop bags from first-tier brands without paying premium prices," said Rainer Kozlik, vice president and general manager of Ingram Micro's Global V7 Private Label Group. 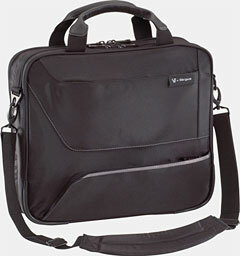 "The V7 by Targus laptop carrying cases are designed for price value leadership, helping our customers' profitability." "We're proud to partner with Ingram Micro and offer this custom-designed line of laptop carrying cases to V7 customers," said Stephanie Piccirelli, vice president alliance sales, Targus. "We believe Ingram Micro provides an excellent distribution channel for our products and we look forward to other cobranding opportunities with V7." Deluxe Top-Loader Case - Fitting up to 15.6-inch notebook computers, this top-loading case with padded shoulder strap features storage space to organize everything from pens and keys to magazines and accessories. Two zippered front pockets offer quick access to items, while the larger separate storage space can hold documents, a power adapter and other accessories. Available in black with gray accents. The manufacturer's suggested retail price (MSRP) for the Deluxe Top-Loader Case is $49.99. Urban Backpack - As a full-size backpack with a dedicated padded storage section, this case can store up to a 15.6-inch notebook computer. The two front pockets offer quick access for keys, pencils, pens or accessories, while two side pockets are conveniently sized to hold water bottles or MP3 players. Padded shoulder straps provide comfortable support and equal weight distribution. Available in black with gray accents, the MSRP for the Urban Backpack is $59.99. Urban Slim Backpack - This backpack's padded storage section is able to house up to a 15.6-inch notebook computer as well as books and pads of paper. A separate zippered pocket provides additional storage, and two side mesh pockets can store water bottles, MP3 players or an umbrella. Its padded shoulder straps provide comfortable support and equal weight distribution. Available in black with gray accents, the MSRP for the Urban Slim Backpack is $39.99. Metro Messenger Case - This messenger bag is sized to hold up to a 15.6-inch notebook computer and has extra space to stash other necessities. Two large front pockets provide storage for books or documents, while smaller gadgets or accessories can be stored in the two mesh side pockets. There is even a dedicated cell phone pocket. A padded shoulder strap offers comfortable support. Available in black with gray accents, the MSRP for the Metro Messenger Case is $34.99. Smart Slip Case - This slip case is perfect for times when you need more than a traditional slipcase but less than a notebook computer case. The padded notebook computer section is sized to hold up to a 15.6-inch notebook computer, and the large zippered front pocket can hold a mobile phone, power adapter or other accessories. Available in black with gray accents, the MSRP for the Smart Slip Case is $24.99. All V7 products are available through Ingram Micro's VAR customers including government and education resellers and on-line e-tailers. "The line of V7 by Targus carrying cases offers VARs and SMBs a trusted brand name backed by the world leader in global logistics," said Chris Lorenz, senior director, vendor management, Ingram Micro's North American V7 Private Label Group. "V7 is committed to delivering high-quality products at the best price, maximizing return on investment for resellers and creating high customer satisfaction." VARs and retailers can contact their Ingram Micro sales team at 1-800-456-8000 for more information or to order V7 by Targus carrying cases. Celebrating its 25th anniversary, Targus invented the laptop case and continues to advance the mobile accessories category with innovative and relevant solutions for today's mobile lifestyle. Targus products enhance productivity, connectivity, and security, liberating users to work in any and all environments with the utmost convenience and comfort. Founded in 1983, Targus headquarters are located in Anaheim, Calif., with offices worldwide and distribution agreements in more than 100 countries. V7 is Ingram Micro's exclusive global house brand for high quality IT accessories, peripherals, and supplies, including notebook computer cases, replacement batteries, LCD monitors, cables, keyboards, mice, and toner. Leveraging worldwide operational excellence, real-time market intelligence and global sourcing power, V7 delivers state of the art products at an unmatched value, maximizing return on investment for resellers and higher customer satisfaction. Unibodies out of stock this week.